Christian (J.R.) Robert Jensen Jr.
JR. Jensen is currently in his ninth season as the swim coach at LSCC. However, his swimming ties to Lake Shore Country Club began 36 years ago with his start into competitive swimming as a ten and under, followed by many summers as a guard at the club pool and then as a coach from 1988 to 2003. JR. also swam for Fairview High School and for the Edinboro University. JR. and his wife Kimberly coach the Fairview High School swim team. For the last 23 years, they have coached the team to 19 District 10 titles, numerous region titles, four National top five rankings in the National Team Power Point, nine high school swimming All-Americans and a consistent winning record with sportsmanship and team cohesiveness as a top priority. JR. brings the same passion of the sport combined with his unwavering commitment to a positive and respectful team atmosphere to Lake Shore Country Club. In 2011 JR. led the Fairview boys team to the PIAA team state runner-up title in the swimming and diving competition. He was also named the Fairview High School Person of the Year. In 2012 JR. led the Fairview boys team to the AA state title, and was named the Erie times coach of the year. In 2013 JR. coached the PIAAAA boys swimmer of the year. JR. has also been named the PHSSCA AA Swim coach of the year three times, and helped to lead the Fairview boys and girls teams to a top five finish in the PIAA state meet on eight occasions. JR. is employed at the Fairview School District as a history and art teacher. He holds a Master of Science Degree in Organizational Leadership from Mercyhurst College. 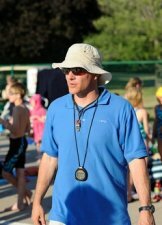 Besides being a coach for Lake Shore County Club, he is also a LSCC swim Dad. JR. is very excited to have his daughter Merrikate, age 12, and his son Finn, age 9,on the swim team this year.